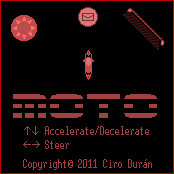 Moto is a simple game, done as part of a challenge in the Devigames USB group, to make a game in one week. The objective is to go around the world, collecting emails. You can play it online here: Moto. The game is done with Actionscript 3 and the Flixel library. The source code is available here: Moto Source Code	(187 downloads) .